The 2013 Scion FR-S uses a Torsen limited slip rear differential for superior traction and Scion explains how it works in this informative video. The 2013 Scion FR-S is a rear-wheel-drive sports car developed by Toyota to bring an affordable sports car to driving enthusiasts. But why did they choose to use rear-wheel-drive instead of a front-drive configuration like most new cars produced today? The rear-drive sports car uses a Torsen limited slip differential, but how does it work? Scion explains it all in the informative video below. But first let’s look at why Toyota chose to use a rear-drive over the popular front-drive configuration. The answer can be summed up in a single word, performance. Performance is greatly increased in a RWD vehicle, because under heavy acceleration, all the weight shifts to the back of the vehicle to the wheels that are supplying power and produces better traction. All true performance cars will have RWD and are extremely fun to drive on twisty and winding roads, and especially on the track where the driver can use the throttle to control the sliding of the rear of the car with proper power and steering. There's nothing like fishtailing in a high-performance rear wheel drive sports car through high-speed turns. That is why RWD is widely accepted as the choice in true sports car performance. Most sports car enthusiasts choose a rear wheel drive engine configuration for this reason: performance and handling. The differential has three very important jobs. First, to aim the engine power at the wheels. Second, to act as the final gear reduction in the vehicle, slowing the rotational speed of the transmission one final time before it hits the wheels. Third, to transmit the power to the wheels while allowing them to rotate at different speeds. In the 2013 Scion FR-S and all rear-drive cars, the rear wheels spin at different speeds when turning. As you will see in the video, each wheel travels a different distance through the turn, and that the inside wheels travel a shorter distance and at a slower speed than the outside wheels. 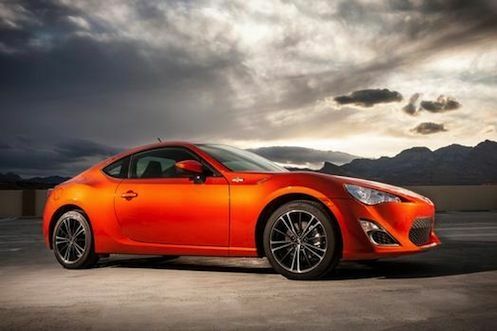 The 2013 Scion FR-S uses a Torsen (from Torque Sensing) differential because it offers superior traction. The Torsen differential works as an open differential when the amount of torque going to each wheel is equal. But as soon as one wheel begins to lose traction, the difference in torque causes the gears in the Torsen to bind together. The Torsen is ideal for a sports car application like the Scion FR-S because of its ability to apply more torque to the wheel that has good traction increasing track performance. The Torsen differential is the preferred differential that is used in high-performance vehicles and that's why it's used by Toyota in the 2013 Scion FR-S rear-drive sports car. TORSEN is a registered trademark of Zexel Torsen, Inc. Check out the informative video from Scion below.